One small act. But first…. According to American Chemistry Council, 76% of households in US throw away leftovers at least once a month, while 53% throw them away every week. The US Government says that the average household waste’s close to $900 per year in food. 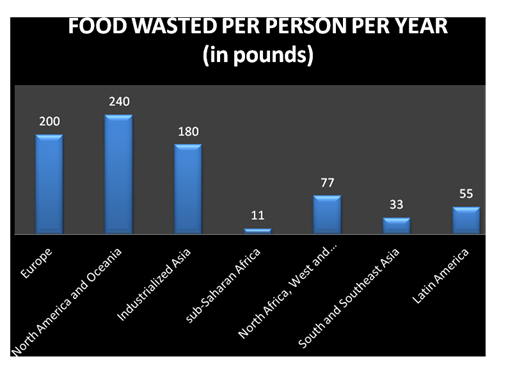 As much as 40% of food goes uneaten in the U.S., according to the government. just 15% of all this wasted food would be enough to feed more than 25 million Americans every year. Most people don’t realize that trashing food is bad for the environment. · Donate your food to food bank. Businesses and people that participate receive tax benefits for their donations and are protected from liability lawsuits by the federal Emerson Good Samaritan Food Donation Act. · Phrases like “sell by,” “use by,” and “best before” are poorly regulated and often misinterpreted. Over 90% of Americans may be prematurely tossing food because they misinterpret expiration dates, according to a separate 2013 study released by Harvard Law School’s Food Law and Policy Clinic and the Natural Resources Defense Council. “Sell by” dates are actually for stores to know how much shelf life products have. They are not meant to indicate the food is bad. “Best before” and “use by” dates are for consumers, but they are manufacturers’ estimates as to when food reaches its peak. · Feeding of food scraps to animals is, historically, the most common way of dealing with household food waste. Feed the left over to pets or your farm animals. · Food waste can be biodegraded by composting, and reused to fertilize soil. Anaerobic digestion plants can provide energy from waste by burning the methane created from food and other organic wastes to generate electricity, defraying the plants’ costs and reducing greenhouse gas emissions.